Lyrics to "I Walk The Earth" by King Biscuit Time from their second EP, No Style. I couldn't find the lyrics for this awesome tune online so here they are! Not in any way cheesy music, just quality indie. 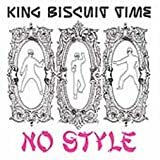 King Biscuit Time is the solo project of Steve Mason who was lead singer of The Beta Band - As John Cusack's character in the High Fidelity film will tell you, check out the Beta Band compilation, The Three EPs if you've never heard their music before. The basic drums, repetitive bass line and vocals make this an awesome song. Really uplifting too. I'm not definite on two lyrics, comment if you think they're wrong. First one is "Take me a day", could it be "take me all day"? Second one is "Hey, knock me," which i first thought was "Hey, not me" but changed to "knock" after reading a comment by ironman9 on the YouTube music video. I don't know your love. Why won't you take me away? Picking on your own reality. Hey good job on compiling the lyrics... Remember looking for them a long time ago and being disappointed at not finding them. Have listened to it a few times the past few days and I reckon it might be: "why must we stay over and above, my love"... Vaguely fits with the lyrics in the rest of the song, perhaps... Not 100% but I can't listen to it now without hearing that. "Why must we stay all alone apart, my love" to me. The world may never know for sure. I think you'll want to place a facebook button to your blog. I just marked down the article, however I had to do it by hand. Simply my suggestion. I've been trying to figure out the chorus for years! I always thought he said "Hey, not me, make an unknown reality," but I told my GF to listen, and she thought "making my own way outta here." And you say something else. I guess it's open to the listener!